Oct. 21, 2015, is when the first act of Back to the Future Part II is set. In the sequel, Marty McFly goes forth and back in time, and complications ensue. It&apos;s a 2015 that&apos;s different from the one we know now — but not that different. On one hand, in the movie, electric cars quietly hum around the streets. We&apos;ve got those. A hologram for Jaws 19 pops out of a theater marquee and freaks Marty out. You can find holograms like that on the Atlantic City Boardwalk. When bad guy Griff gets arrested for wrecking the clock tower near the lake? A drone takes his picture for USA Today. And the Chicago Cubs, in the Back to the Future universe, win the World Series in 2015. As of right now, they can still make that happen. Of course, there&apos;s a lot of stuff that Back to the Future Part II doesn&apos;t get right. Our cars don&apos;t fly. Our shoes don&apos;t tie themselves. Our clothes don&apos;t blow dry themselves, either. 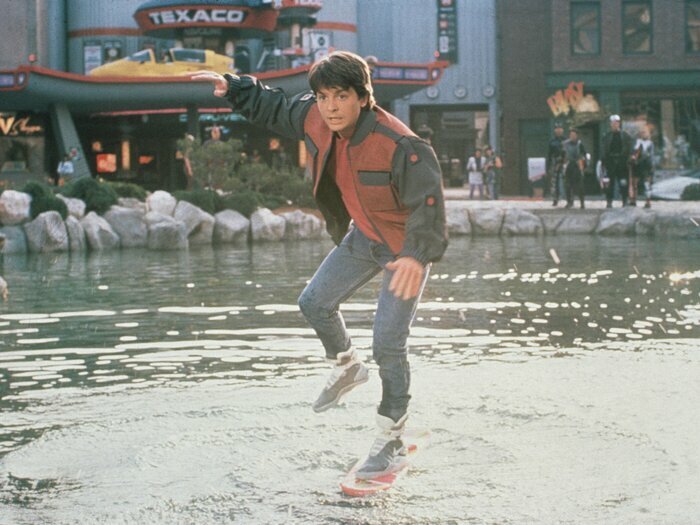 And what we call "hoverboards" today don&apos;t really hover, if we&apos;re going to be honest. So what does a 1980s movie tell us about ourselves today in 2015? Does it say anything about how we got here? Not really, according to Rick Carter. He was the production designer on the movie. "It&apos;s an attempt to stimulate in the time it was made. It wasn&apos;t made for now." Carter&apos;s got strong credits when it comes to time travel. He also worked on A.I. Artificial Intelligence, Avatar and the new Star Wars movie. Carter says time-travel stories are more about the time in which they were made. And what was big in the late &apos;80s when Back to the Future Part II was made? Buying stuff. "Not just product placement, but the branding of our culture," says Carter. "This was no longer the hippie era where everything that was of corporations was being pushed to the side in terms of being hip or cool. It was a celebration of what the culture and the economy was creating." Like a hologram Ronald Reagan selling fast food. It was, at least, a somewhat optimistic view of the future. More optimistic than, say, Blade Runner. To Carter, creating the future wasn&apos;t about predicting. It was about making the present seem better. "That&apos;s how we saw the holograms coming out of the movie theaters, or the litter bug that&apos;s running around that&apos;s positive, sweeping things up," says Carter. "It was about projecting from a very exuberant sense we had at the time being young until now." That exuberance was tempered a bit, though. With some pointed jokes knocking nostalgia, the movie knew that the future wouldn&apos;t be perfect. Or was it the past?